Business lobby groups are pushing hard for investor-state dispute settlement (ISDS) in the Transatlantic Trade and Investment Partnership (TTIP) and similar trade deals. If successful, this would expand the ability of corporations to sue governments in international tribunals, demanding billions in taxpayer compensation for public interest policies that allegedly limit their profits. Especially safeguards for human health and the environment would be on the line. Already embedded in many trade agreements, over the past few decades, ISDS has developed into a cash cow for corporations, granting them multi-million dollar awards and settlements in compensation for governments regulating in the public interest. Take the case of Argentina which has been ordered to pay a total of US$900 million in compensation for measures it took to fight its 2001-2002 financial crisis. ISDS is also a powerful tool for big business to delay, weaken, or prevent legislation that could affect its profits. Togo, for example, has held back anti-smoking measures out of fear of expensive investor claims by big Tobacco (such as Philip Morris’ lawsuits against Uruguay and Australia over cigarette packaging regulations). The EU Commission undertook the largest survey in its history and got a 97% negative response to TTIP. So it doesn’t come as a surprise that corporate lobby groups are pushing for ISDS in the Transatlantic Trade and Investment Partnership (TTIP) between the EU and the US, the EU-Canada Comprehensive Economic and Trade Agreement (CETA) and other proposed EU trade deals. Take the European Services Forum (ESF), for instance. In 2014 this influential and well-connected lobby group, which represents global services companies from Deutsche Bank to Microsoft to British Telecommunications, wrote to the then-EU Trade Commissioner Karel de Gucht calling for a “strong investment protection with state of the art investor dispute settlement”. They even went as far as to claim that “should there be no ISDS option in TTIP, this would also result in a denial of justice”. That is, a very privileged and one-sided notion of justice only to be used by big corporations with the necessary resources to initiate these highly cost-intensive claims. The ESF’s commitment to promote investor-state arbitration in ongoing trade agreement negotiations has not sprung out of nowhere. Policies regulating public services – from capping the price of water to reversing earlier privatisations – have already been targets of ISDS claims. More than half of all investor-state claims known globally in early 2016 (463 out of nearly 700) were related to services sectors. Out of 21 ESF member companies, six have launched investor attacks against states (including Deutsche Bank, IBM, and Orange). Fortunately for the EFS, they are not alone in their fight for corporate privileges. In January 2015, the group along with the employers’ lobby BusinessEurope (BE) and the chemical industry lobby group CEFIC (European Chemical Industry Council) issued a statement asserting that the “inclusion of ISDS in TTIP is crucial as it will provide the means to to enforce… principles via a neutral, fact-based and apolitical form of dispute settlement”. The only problem with this is that at no point in its existence has ISDS been “neutral”. With arbitrators paid per case in a one-sided system where only investors can bring claims, there is a built-in incentive to side with these investors. Looking at the companies that BusinessEurope for example is lobbying for, a pattern quickly emerges: out of the 70 member companies the group offers “particular services” to and that “enjoy an important status” within the structure, more than 20 per cent have launched investor claims in the past, including Télefonica, UPS, Total, Siemens, Shell, ExxonMobil and numerous others. Telenor vs Hungary, filed in 2004, decided in favour of the state. The claim by Deutsche Bank against Sri Lanka deserves particular attention. It resulted in a poor country being ordered to pay US$60 million in compensation (plus interest and US$8 million in legal costs) to one of the biggest banks in the world. Because of allegations of corruption, the highest court in Sri Lanka had decreed that payments to Deutsche Bank, which would have been due according to a hedging agreement with the state oil company, should be suspended. The decision has whetted appetites in the financial services sector because it recognises a financial market instrument as an investment worthy of protection – even though it did not involve any physical business activity by Deutsche Bank in Sri Lanka. ESF is so keen on ISDS that when the Commission – in response to the tidal wave of public opposition to ISDS in TTIP – proposed some procedural changes for investor lawsuits and re-labelled ISDS as Investment Court System (ICS), it reacted like a spoiled child. It was outraged that a democratic uprising might get in the way of the unadulterated fulfilment of its wishes, regardless of the fact that the ICS is still fundamentally problematic, allowing companies to sue governments over public interest laws. ESF was furious that the proposal included reference to governments’ “right to regulate”. Long before the TTIP negotiations were launched, ESF’s managing director Pascal Kerneis had already announced that “industry will oppose any deal in which investment protection is traded off against public policy objectives, including human and labour rights”. For their persistency in promoting a system that offers everything to big corporations and nothing but financial liability to citizens, Corporate Europe Observatory, together with three organizations working on lobby and transparency related issues at the European level, has launched the Democracy for Sale Awards, “honoring” the most successful lobby groups that have been involved in the backdoor concoction of TTIP. Besides the lobby groups mentioned above (BusinessEurope, ESF, CEFIC) the list of nominees includes amongst others: the US Chamber of Commerce (Big Business), the European Crop Association, ECPA (Pesticides lobby) and the European Federation of Pharmaceutical Industries and Associations (EFPIA). 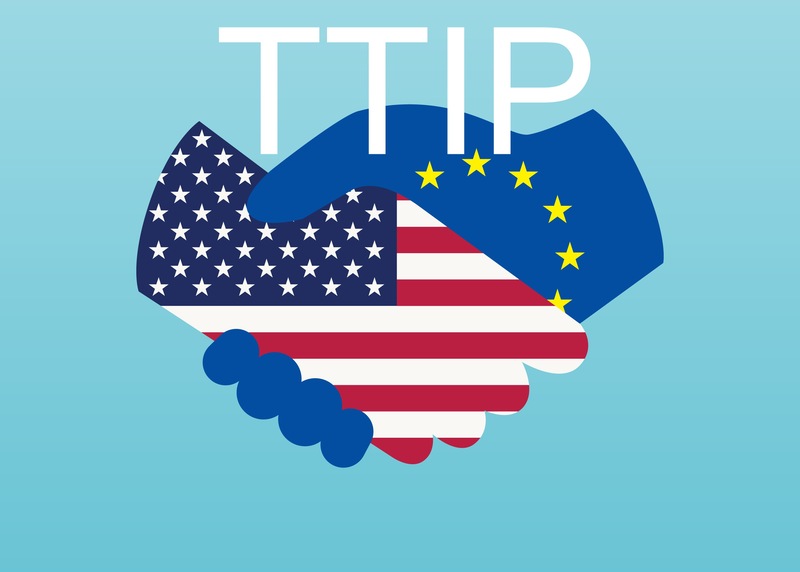 Will the UK have to abide by the EU-US TTIP agreement for the two year period to be free from the European Union? The EU supports ISDS arbitration in general, while recognising the need for its reform. Indeed a consensus seems to be emerging on systemic problems found in this increasingly used system. That has led the European Commission to propose some innovative provisions in the framework of negotiations on EU trade and investment agreements, but without calling into question the ISDS system itself.